Every job has its highs and its lows and very occasionally something so extraordinary happens it is left indelibly stamped on your mind. MSC Napoli was beached at Branscombe in 2007 to avoid a maritime pollution disaster. Image from Maritime and Coastguard Agency. 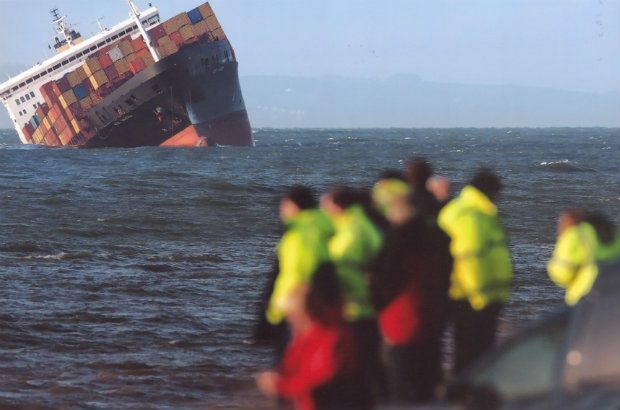 One such event was the MSC Napoli – a 62,000 tonne container vessel ‘shipwrecked’ off the UK’s famous Jurassic Coast in 2007 after it got into difficulties in the English Channel. The crippled vessel, which had been badly damaged in a violent storm, was purposefully grounded off Branscombe in East Devon to avoid a pollution catastrophe at sea. I led the Environment Agency's response and chaired an Environment Group, which was convened to join up all partners dealing with the major incident so we could work together to manage and reduce the impact of this maritime disaster. Little did I know on the 20 January 2007 that the international multi-agency recovery and salvage operation that followed would take up most of my working life for the next two and a half years! The drama began on 18 January 2007 when the Napoli, a 62,000 tonne container ship enroute from Antwerp to Durban, South Africa, ran into a violent storm off Brittany. The ship put out a distress call after suffering ‘catastrophic damage’ to its hull. All 26 crew were airlifted to safety in a rescue operation co-ordinated by UK coastguards. Force 11 northerly winds made it impossible for the vessel to shelter along the French coast, so the French government asked the UK government if the crippled ship could be towed across the Channel into UK waters. The Napoli was still afloat, but listing badly. The ship’s assorted cargo included explosives, fertiliser, weedkiller, car engines, chocolate, bibles, vodka, shampoo, wine, coffee, perfume, dog biscuits and frozen ducks. The initial plan was to tow the ship to Dorset’s Portland harbour, but because of the risk of it sinking, it was decided to bring the vessel into the sheltered waters of Lyme Bay where it could be beached near Sidmouth. On the morning of 20 January 2007 the Napoli came ashore off Branscombe. Within hours, the latest ‘visitor’ to Dorset’s Jurassic Coast was front page news and thousands of sightseers descended on the picturesque village of Branscombe to get a close-up look at the vessel. As the sheer scale of the operation became apparent, the government launched its National Contingency Plan for Marine Pollution. The Maritime & Coastguard Agency established a Salvage Control Unit (SCU) to deal with the salvage operation and a Marine Response Centre (MRC) to manage the pollution response at sea. Meanwhile, an Environment Group was hastily convened to minimise the environmental impact of incident and help co-ordinate a land-based response. Organisations represented on the group included the Environment Agency, Maritime and Coastguard Agency, Natural England and Public Health England, Natural England, Health Protection Agency, Centre for Environment, Fisheries and Aquaculture Science (CEFAS) and the RSPB. The grounding of the Napoli was such an unusual event we had to be very innovative. We were fortunate in that the Environment Group was well supported by its partners. It meant during the first two weeks we met continually to help manage the incident as it unfolded. Not all sightseers were happy to simply look at the beached vessel. Hordes of people arrived from all over the UK intent on scavenging cargo from containers washed ashore. Boxes of shampoo, wine barrels and even BMW motorcycles, still in their packing crates, were manhandled off Branscombe beach by an army of modern day ‘wreckers'. Salvage experts worked round the clock to remove oil from the vessel. Divers drilled into the hull and emptied oil from all of the ship's fuel tanks within eight weeks of beaching. The salvage operation was helped by fine weather. The Environment Agency and CEFAS carried out monitoring throughout the salvage operation to check for signs of pollution and assess the environmental impact in the sea and surrounding coastline. Cargo from broken containers, especially lighter plastics, were carried on tides as far as East Sussex. By the summer of 2007 the decision to re-float the Napoli was taken. Although this was done successfully, the vessel was too badly damaged to be towed so it was dismantled instead using explosives to separate the bow section from the stern. A scan of the seabed showed that by July 2009 every last trace of the Napoli had been removed. The whole operation had taken two and a half years and had cost in excess of £120 million. The multi-agency Environment Group was later praised by the Napoli’s owners and other responders for its effectiveness and reactive approach. The grounding of the MSC Napoli was arguably also a turning point that prompted a positive change in the way such incidents are dealt with by the authorities.